With the world’s largest population, the People’s Republic of China is now focused on developing a hospitality model for senior living. Will 2018 be a year of opportunity or challenge? Two current issues can make a big difference in individual performance: minimum wage impacts and CNA turnover trends. Residents with cognitive impairment present unique challenges and opportunities for the senior living field. There’s little doubting that senior living now faces a severe worker shortage, but new tools also are emerging. LeadingAge’s board chair talks about the labor and policy challenges operators must face. Gadgets that help prevent injuries were more prevalent than ever at CES 2018. Assisted living communities ranked fourth out of five settings when caregivers were asked their preferred work setting in a recent survey. 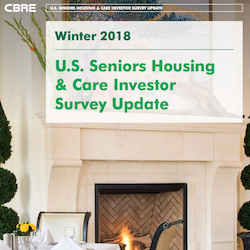 Tax reform uncertainty in the fourth quarter of 2017 contributed to a decline in the number of publicly announced seniors housing-related acquisitions. The changing regulatory environment may be top-of-mind for senior living owners and operators, but that is not the case for seniors housing investors, developers, lenders and brokers.